A CombineD team of Crime Branch and Gorakhpur police busted online satta on IPL match at a flat of Government Building in Anna Mohalla, on Sunday. 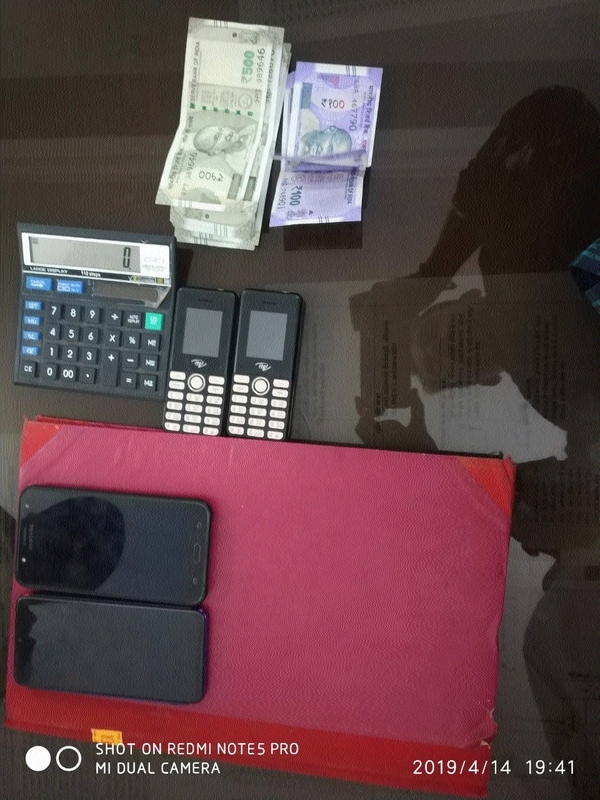 Police have arrested two of the five accused and seized Rs 12,300 cash, four mobile handsets, a television set and a register of bookings worth lakhs. The arrested have been identified as Surendra Patel (26), resident of Bhairobaba Mandir, Rampur and Mubin Khan (23), resident of Durga Nagar, Rampur, Gorakhpur while other accused named Rehan, Jogi Vishwakarma and Siddha. Superintendent of Police, Nimish Agrawal given direction for putting up strict check on operation of Satta on IPC Cricket matches and taking stern action against accused. Compliance with the direction, separate police teams under the supervision of Additional SP (South), Dr. Sanjeev Uike, Additional SP (Crime), Shivesh Singh Baghel and CSP, Gorakhpur, Alok Sharma started a rigorous campaign against Satta operation. During the campaign, Crime Branch received information about some persons engaged in taking Satta bookings on IPC Cricket match on second floor of a government building in Anna Mohalla near rail line. The team nabbed two boys Surendra Patel and Mubin Khan red-handed while taking bookings of satta. In the raid, policemen heard a received call on mobile of Surendra Patel in which a man named Rehan told him for sending Rs 10,000 of IPL match. In two more calls, Jogi Vishwakarma and Siddha told for giving Rs 5,000 each for booking of satta. Police have registered a case under Section 4 of Satta Act and sections 109 and 34 of IPC and started search for Rehan, Jogi Vishwakarma and Siddha. Satta was busted with active working of police team led by SHO of Gorakhpur, Umesh Tiwari comprised of Crime Branch’s ASI, Rajesh Shukla, Head Constables, Dhananjay Singh, Vijay Shukla, Constables, Bramhaprakash, Mohit Upadhyay, Deepak Raghuvanshi and Gorakhpur’s PSI, Rohit Dwivedi and Constable, Harak Bahadur.